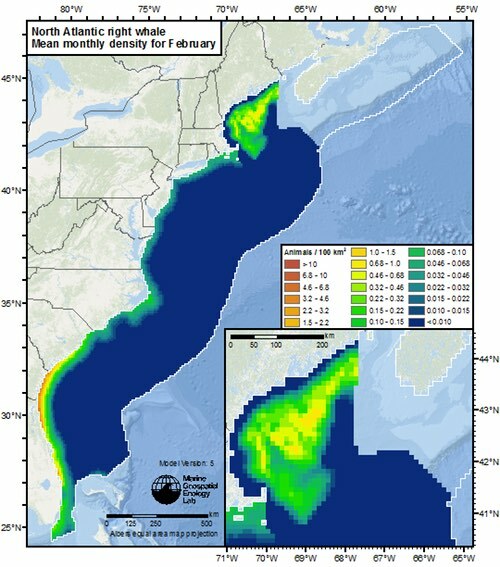 In addition to an open-access paper published in Nature Scientific Reports, a set of comprehensive species-specific supplemental reports (each one running to over a hundred pages), and a good layman’s overview using the Story Map platform, the Lab also has an online mapping portal, OBIS-SEAMAP, that displays annual animal densities for marine mammals, seabirds, sharks, rays, turtles, and even a few lizards of conservation concern. 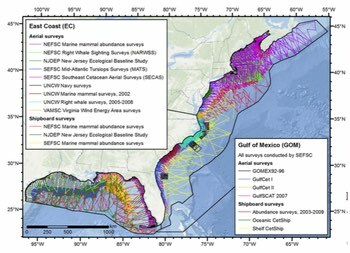 OBIS-SEAMAP—short for the Ocean Biogeographic Information System: Spatial Ecological Analysis of Megavertebrate Populations—archives hundreds of surveys, satellite telemetry datasets, and photo-ID collections, and has now expanded to include long-term archival of species distribution models. While the new distribution maps are the most eye-catching product of this work, and the data underlying them should greatly improve our ability to identify areas with high concentrations of one or many species (and hopefully then to limit our activities at some times and/or places to avoid the worst effects), the bulk of the underlying research is a very deep dive into the science of modeling. In addition to looking at a range of underlying oceanic habitat factors (including temperature and plankton densities), the supplemental reports use three different types of models to estimate animal abundance, then dig into clues about why they’re different. And, alongside all the abundance estimates, they calculate the “Coefficient of Variation” of their estimates, which gives an often finely-tuned assessment of statistical confidence, based on how much data is available in each small subsection of the surveyed area. All in all, it’s mightily complex for the layman, but a solid starting point for further study and better estimates in the future. 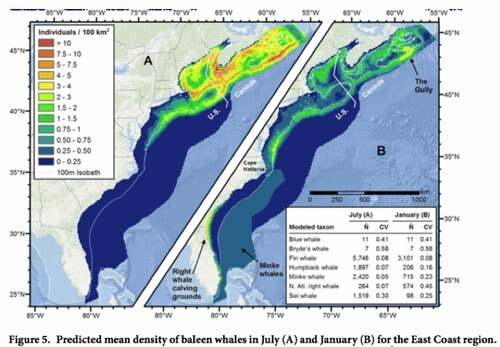 Below is an especially relevant example, showing the seasonal shift in abundance of the North Atlantic right whale, a species of special concern, in that its numbers have dwindled to just a few hundred, making any single mortality important to the species’ long-term survival, and also raising questions about the possible effects of stress, especially in the winter birthing grounds along the southeastern coast. These issues are in the middle of ongoing controversies about proposed offshore oil and gas exploration (UPDATE, 3/15/16: Feds say no to new Atlantic drilling), a new instrumented Naval training range planned for 50 miles offshore, and of course, the perennial tug-of-war over permitting of Naval training activities all along the east coast. Note the abundance estimates; 100 square kilometers is an area roughly 6 miles on a side. 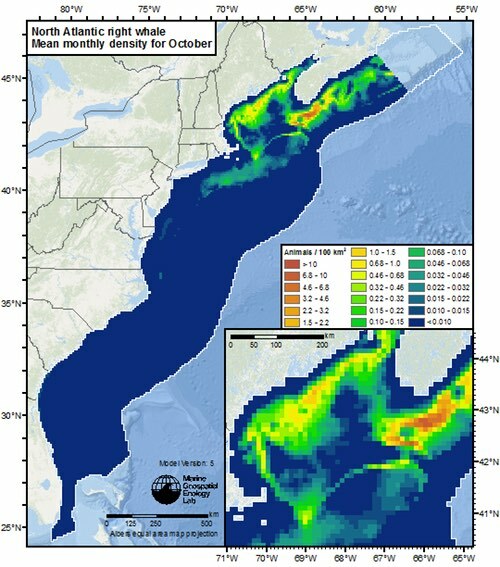 If you want to play with more maps, check out the NOAA CetSound site; the sound side includes sound maps for various US offshore regions and the entire North Atlantic (at different depths and frequencies), while the cetacean abundance side has an interactive map of designated Biologically Important Areas, and data quality ratings for distribution estimates for each month; presumably, the new distribution maps will find their way onto the Cetsound site at some point. Another federal ocean data portal, MarineCadastre.gov, is also compiling maps to help illustrate and inform a range of development and conservation efforts; the new Duke maps will be included there soon as well.